Finally. . .we were able to pass through the snowbanks. . .and get to the cabin. It's been eight months since the snow arrived. It's mostly gone now except in shady spots in the woods, and one spot on the road up the mountain where it has stayed deep and mushy for weeks on end! Each time we have arrived at this spot, one or more 4x4 trucks have been stuck. Brent has pulled three of them out of the deep snow so far. On our last trip up the mountain we again towed someone out and they returned down the mountain and said they'd try again another day. But my optimistic husband thought that we could get through. I held me breath, and he slowly inched along through the deep, packed yet mushy snow. And we made it! Once we were through that part of the road it was clear driving all the way in. The wildflowers were blooming on the mountain top. Due to the difficulty we had getting there this year, we missed seeing the early spring flowers. But the violets, wild strawberries, and calypso lady-slippers are all blooming and looking cheerful and beautiful. We un-boarded the cabin and were happy to find everything exactly as we left it. No mice! No leaks! It was cozy, clean, and comfy, just as we left it. In the midst of winter, the snow levels reach the second floor, so both the lack of mice and leaks is a sure victory. We enjoyed a picnic lunch in the sunshine, a hike through the woods, and some quiet time with a good book. It was a happy relief to finally be able to spend some time on the mountain. 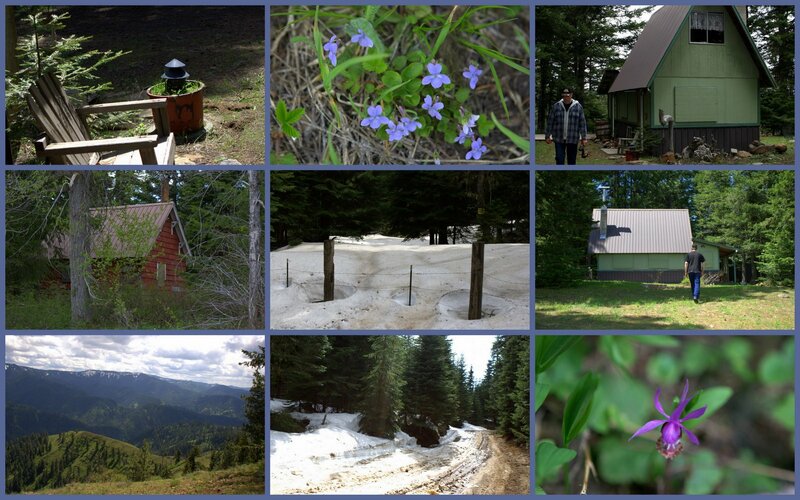 Oh what a fun adventure to embark upon... each spring being different at your little cabin! It will take awhile for me to get caught up on reading your blog, but appreciate your comment on my most recent post. What a whirlwind...my head is still kinda spinning, and i am playing 'catch up' after 3 week vacation, 1 week in hospital w/J and home now. whew!!! What a special treat! I would love to see the wild flowers and sit with all that quiet, reading a book. Then a picnic too would be pure pleasure. It looks so beautiful and peaceful. Heaven will be like that. A sanctuary of peace. You are fortunate to have so a lovely get away. Glad you made it through. I bet those people were happy to see your guy willing to help them out! Oh my, La Tea Dah. How beautiful! So this is your cabin? All I would need is a hammock between two trees - and a good book! So glad you were able to get in to the cabin and that you found it exactly as you left it.